July 14th saw the release of Harper Lee’s ‘other’ novel, and Go Set a Watchman has caused a flurry of activity in the literary world, especially among English Teachers, that iconic group who love to intersperse their daily conversations with quotes anywhere from Shakespeare to Stephen King (depending on their personal proclivities). I must confess I preordered copies of the new book (must have extras to give away!) and was delighted they came in the mail on the very day of its release. Of course, I immediately set about to greedily devour the novel. Coming up for air with occasional outbursts of, “I know how I would teach this book,” and “Oh, yes, I will use that excerpt in my classes this next year”, my husband finally said, “You should write a column on how you would teach this at the high school.” I’m not sure how many of this paper’s readers care about how an English teacher would teach Go Set a Watchman in her sophomore English classes. But if you loved reading To Kill A Mockingbird (forced-fed to you, no doubt, at the beginning) or you merely remember reading To Kill A Mockingbird, I think you will find an English teacher’s perspective on this new book food for thought. First of all, let me clarify that my sophomores will have read To Kill A Mockingbird just the year before in their freshman English classes. Nacogdoches High School’s ninth graders study this book; and as a former ninth grade teacher, I taught Mockingbird for over fifteen years. So, how does Harper Lee’s new novel measure up? Do I agree with Tay Hohoff’s granddaughter, Therese Nunn, (Hohoff was Lee’s book editor for To Kill A Mockingbird) who stated Go Set a Watchman “should not have seen the light of day”? When Watchman’s manuscript was recently discovered, Lee was asked if this was a prequel or sequel to the Mockingbird book. Lee responded, “It’s the parent.” Ah, exactly. I’m sure we all have friends with whom we’ve grown especially fond and have become familiar with all their eccentricities. Then we meet one of their parents; and, as we visit, we can’t help but smile and think, “I’ve seen that quirk before” or “I’ve heard that before”. As parents we always hope our children inherit our best qualities and then improve upon them. That is certainly the case with the Watchman book. As we read it, we definitely see the understated humor we so enjoyed in Mockingbird. Lee captures the essence of the South in not only her descriptions but also in what she chooses to describe. (A gardening friend and historian Greg Grant reading the Watchman book said he was “already excited with the first paragraph as grown up “Scout” finds comfort in tin roofs, verbena, swept yards, and white washed tires…all my favorites!”) Lee digresses into family genealogies and Maycomb’s founding fathers in a way only a true Southerner can appreciate. She addresses the issues of church, education, and the female role in Southern society with rich verbal irony (sarcasm). And, of course, we are introduced to Scout, a character many will come to love in the Mockingbird book. Lee’s writing style is already evident in this early book, and for the student of literature, it will be an easy illustration of writer’s voice. That is why it will be so important to teach it in my classes. But if (as Lee said) the Watchman book is the parent, we must remember the parent is not the child; and in this case, Go Set a Watchman is not To Kill a Mockingbird. It’s important to see the order here. Many authors produce great books and then, down the line, start churning out ‘ho hum’ shams, merely cashing in on their fame. This is not the case here. Go Set a Watchman was written first; and though many may feel Watchman “should” not see the light of day, more than likely without the expertise of a good publishing editor, To Kill a Mockingbird ‘would’ not have seen the light of day. After reading the Watchman manuscript, the publishing editor handed it back and asked Lee to rework the flashbacks of her childhood into a novel in its own right. Yes, the editor. Enough cannot be said about editing and revising. (You’re all rolling your eyes at me now. I know. I know. ‘English teacher’.) But it is the truth, and it is also an uphill battle with students. When most students finally get something down on paper, they never want to look at it again. Even my good student writers. The editor who first read Watchman (Hohoff or some unnamed soul) recognized the writing potential of Lee, all those wonderful characteristics of style: understated humor, digression, descriptive figurative language, sarcasm, characterization. But they were, as yet, unrefined. In Watchman, it is evident that Lee clearly feels the burden to express to non-Southerners the uniqueness of this society, warts and all, in a time of deep unrest, the 1950s, the beginnings of the Civil Rights Movement. So, what does the editor do? He suggests she approach her subject again, afresh, using a more sympathetic character- young Scout. Aren’t we grateful he did? The difference in quality between these two books is apparent enough for even high school students to recognize, and I look forward to pointing out to them the need to rewrite. Start over and approach a subject again. Revise. Edit. Two and a half years of editing if that’s what it takes. That’s how long it took Lee. In To Kill a Mockingbird Lee polished the reminiscences of young Scout and even added her as a second narrator (and the more prominent one) to the adult Scout. Brilliant. Now all the harsh realities and ugliness of society could be made approachable through the guileless observations of a six to eight year old. In contrast Watchman’s adult Scout not only limits point of view but she is also commenting on situations too close to home. The plot would have been contemporary for the 1950’s reading public. The infectious sore that Civil Rights was addressing was too raw and too sensitive. Presenting the same issues of Southern society in Mockingbird, set as a flashback thirty years earlier, allows the readers to be more subjective of the criticisms. ‘We’ are not being hateful; ‘they’ were, that other generation before us. Hopefully, as I point out this fresh take on Lee’s subject, I will convince students to start again. Write their essays again from a different perspective, using different examples. Ask themselves what they want to accomplish and who is their audience. Are they getting across their ideas? Lee did this. The result? Watchman forces the reader to choose sides along political lines. Mockingbird draws back and tackles these poignant issues as universal ideas about judging others. This is no longer a commentary only on racial problems between Blacks and Whites. The unjust trial of Tom Robinson in Mockingbird is bookended with Boo Radley, malevolent ‘monster’ living in the derelict Radley house. The novel begins and ends with Boo. Suddenly the hatred between the races in the South is merged with a conflict we all know: fear, mistrust, even hate for who or what we don’t understand. Prejudice for anything different or outside our comfort zone. This is what revision can accomplish: an expansion of a theme, a crystalizing of an idea, a Pulitzer Prize winning novel that becomes timeless in it’s significance. 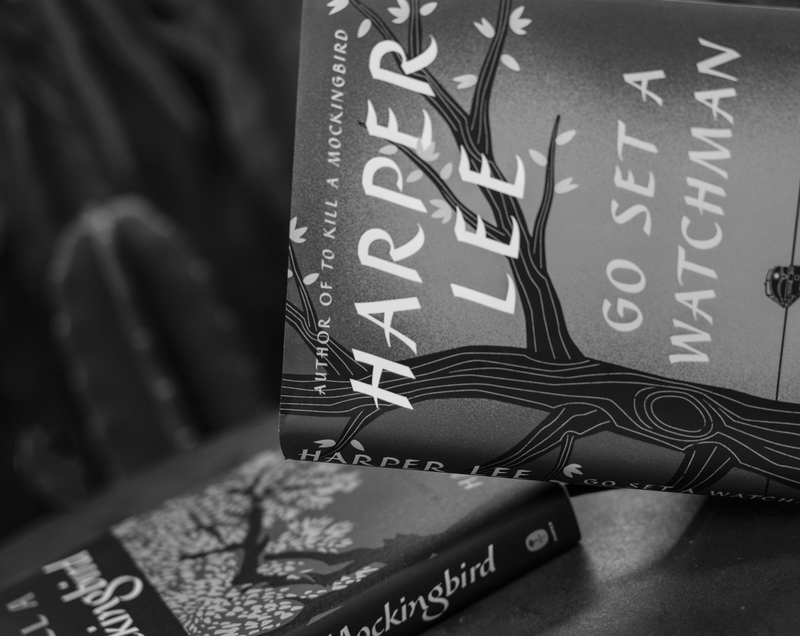 Go Set a Watchman should join To Kill a Mockingbird in the classroom. It is a true example of the necessity of revising and editing, for the writer’s craft of Lee is evident in her parent book. But Go Set a Watchman is no Pulitzer Prize winner. Go Set a Watchman has no Boo Radley. This entry was posted in Leica, Uncategorized, Words by Jeff Abt. Bookmark the permalink. Leabeth you are so right! I’m not finished with ‘Watchman’ yet since you told me not to hurry to devour it but I fully agree with what you have said. I never tired of reading ‘Mockingbird” and no matter how many protests in the beginning pages I don’t think a single one didn’t love it by the time we finished. I never tired of teaching it and still find something new on each re-read.